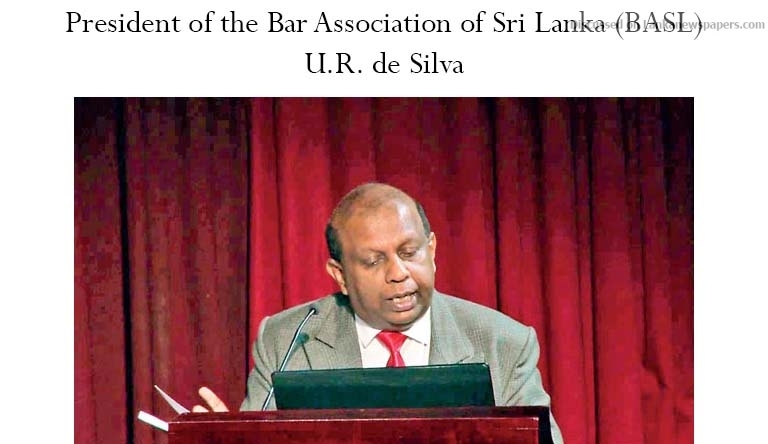 President of the Bar Association of Sri Lanka (BASL) U.R. de Silva, PC, yesterday acknowledged that guidelines were needed to regulate sponsorships. De Silva admitted that there was a need for the BASL to set guidelines when The Island sought an explanation as to why the BASL had obtained Rs. 2.5 mn from tainted primary dealer, Perpetual Treasuries Limited (PTL), over a year after the exposure of its direct involvement in the first Central Bank treasury bond scam perpetrated on Feb. 27, 2015. The BASL Chief said that when the matter was brought to his attention, inquiries had been made to ascertain the circumstances under which the funds had been received from the PTL. The PTL was among the companies which sponsored the three-day Law Asia 2016 Golden Jubilee Conference in August, 2016. The Island pointed out that the BASL event was held several months after the second treasury bond scam had been perpetrated in 2016 March. PTL owner Arjun Aloysius, along with its CEO Kasun Palisena, are in remand pending further judicial investigations while Arjun’s father-in-law Singaporean Arjuna Mahendran, former Governor of the Central Bank of Sri Lanka (CBSL) is still evading arrest. Responding to another the BASL President said that Supreme Court judge Prasanna Sujeewa Jayawardena, who had served as a member of the Presidential Commission of Inquiry into treasury bond scams, had not been involved in raising funds for the event though he was an active member of the BASL and served as its Deputy President at the time. De Silva emphasised that there had been several organising committees and one had been entrusted with the task of securing sponsorships. The BASL President pointed out that Justice Jayawardena had been chosen as a member of the Presidential Commission on Inquiry into treasury bond scams only in 2017 January. General Secretary of the Communist Party and former Chairman of Committee on Public Enterprises (COPE) D. E. W. Gunasekera told The Island that the BASL owed an explanation as to why funds had been solicited from PTL. Gunasekera insisted that BASL couldn’t be unaware of the PTL involvement in the biggest ever financial scam involving the Sri Lanka Central Bank as there had been an extensive media coverage of the rackets since March 2015. U.R. de Silva emphasised that many sponsorships had been received by the BASL not by individuals and all funds so received had been audited and presented for follow-up action. Referring to a case filed in respect of the alleged treasury bond scam that had been dismissed and the three-member committee appointed by the UNP to inquire into 2015 transaction, U.R. de Silva said that at the time PTL funds were received by the BASL, the Presidential Commission of Inquiry hadn’t been appointed. He said that any organization soliciting funds from business enterprises had to be cautious in the wake of revelations pertaining to treasury bond scams. Gunasekera pointed out that in addition to the BASL, two attorneys-at-law Dayasiri Jayasekera and State Minister Sujeewa Senasinghe, too, had received one mn and three mn rupees, respectively in 2015 and 2016. Gunasekera said that the BASL couldn’t afford not to conduct a thorough inquiry into PTL payments received by lawyers excluding those who represented the company and its subsidiaries before the Presidential Commission and the Fort Magistrate. De Silva said that the BASL acknowledged the need for comprehensive investigations into allegations.